Do you need to transfer a group of people but you do not know how to? In Anser Europe, we offer you the perfect solution. Use our van rental service with a driver in Madrid and let us do the rest. Tell us the destination and we will take you with maximum safety in mind and a guarantee of professionalism and punctuality. What is the van rental with a driver in Madrid like? In case you want your employees to go to a meeting of some sort or an event without anyone suffering any mishaps, in Anser Europe, we offer you the best solution: the van rental with a driver in Madrid, since it is the most comfortable and efficient way to carry out the transfer of multiple people with the confidence of an expert company in the transport sector. Avoid problematic situations and let our professionals take you wherever you need to go with maximum safety and professionalism. Contact us and receive information about our prices and promotions for van rental with a driver in Madrid and enjoy the journey. In Anser Europe we offer companies and individuals cars with professional drivers for business and leisure trips. 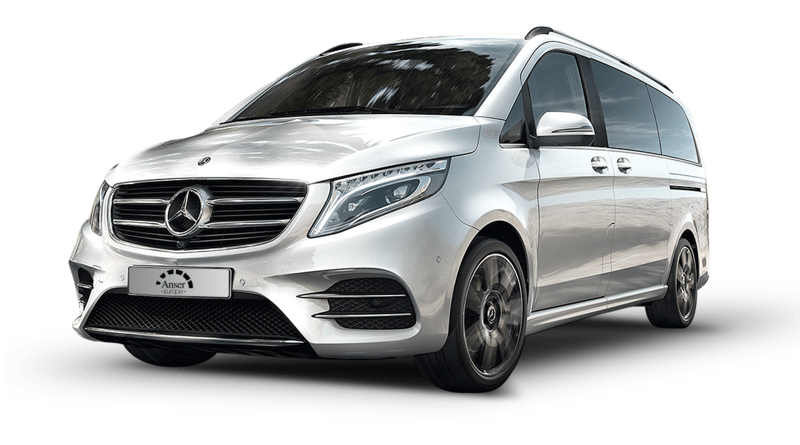 From tourist routes through Madrid or Barcelona to transfers to the Malaga airport from Marbella comfortable and fast, services for weddings and special events.